To have a successful online marketing campaign it is important that you make use of all the online marketing tools effectively. There are various tools that are available but using it effectively will certainly guarantee you business success. Among all the marketing tools that are available these days the most effective marketing tool are the various social networking sites or platforms that are available. Various social networking sites like facebook, twitter, Instagram, LinkedIn are the most popular ones. The benefit of using social networking platform is that you will be able to get you business global and you can advertise your business globally. You can also get huge amount of traffic on these sites as most of the people stay online during the major part of the day. You can also target people belonging to various age groups. Every social networking site that you can think of has got different marketing techniques and strategies which need to be applied differently. Without these strategies the entire marketing campaign can go for a mess. Among all of them today we are going to talk about Twitter. 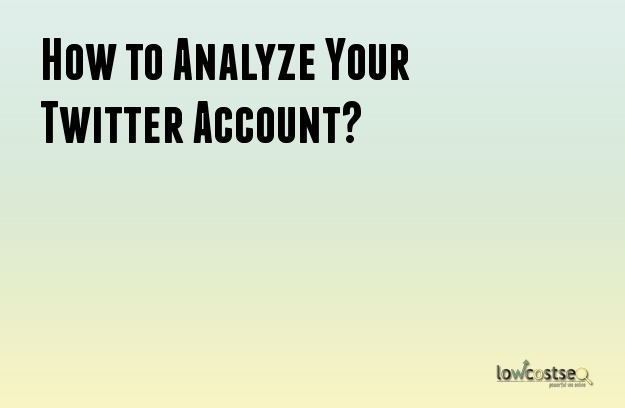 Yes, here you will learn how to analyze your Twitter account in order to find out whether you are getting positive response for the marketing you are doing. Make sure that you keep a track about a fact that whether your audience is regularly visiting your content and having an interaction on a regular basis. For a successful marketing campaign it is important that your audience should be fully engaged to your account. This will help you analyze whether the strategy you are applying is working or not. The best way to find out whether your twitter account is being visited regularly or not is by simply tracking the number of people who see your tweets on their timeline. This will definitely make you understand the success rate of your twitter account. Having your tweets on their timeline would mean that your account is doing impressively well and your strategy is working. When you prepare a twitter account related to your business you certainly want a certain group of people to visit your account. These are basically your targeted audience whom you feel will be prospective for your business. However, not all audience can turn out to be prospective. This is the reason why it is important you keep a track of the type of audience that visits your account. The other way to track whether you twitter account is receiving enough audience is by tracking the volume of audience rush. If you see that your account is having a good volume of traffic then you can be rest assured that you will have planned out a good strategy. Also make sure to find out what is the reach of your customers. This will get to know by checking out their individual profile. The other thing that will help you to understand whether your account is responding well is by checking the response rate of your audience.